With the huge volume of messages landing in your users in-boxes every day how do you make your important SharePoint Alerts and Reminders stand out? 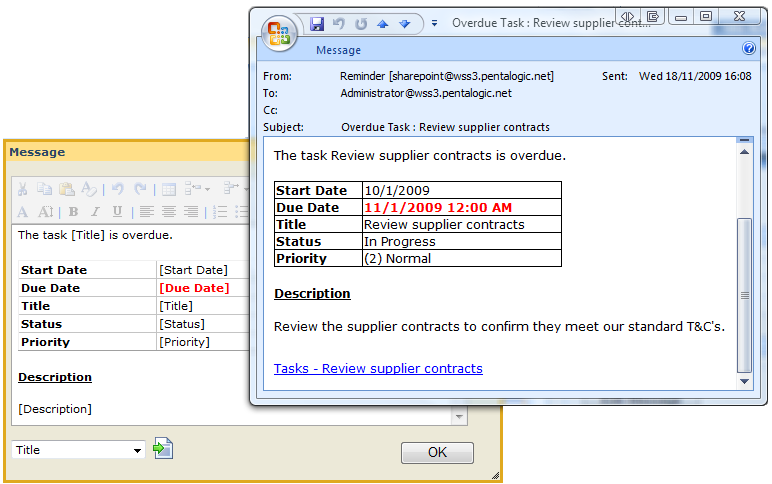 Easy with the new Rich Text Editor in v1.7 of SharePoint Reminder Webpart. The Editor uses the SharePoint’s intuitive WYSIWYG interface, which will be easy for any user of Microsoft products to pick up. It allows you to add Rich Text formatting including font sizing, text effects, color and tables to Reminder alert emails – helping you to get the message across! Reminder is a hugely popular product – perhaps because email alerts for tasks and events are such an integral part of everyone’s working day now. SharePoint out-of-the-box offers an “Alert Me” function. New users often see this and think they have something similar to the date based alerts they are used to receiving from Outlook for tasks and calendar events. When they discover that SharePoint’s Alert Me feature will only notify them of changes to list items as they happen, disappointment often sets in. Pentalogic Reminder addresses that issue by providing a more familiar date based alert system for SharePoint users. It enables users to schedule alerts for both upcoming and overdue events in SharePoint and is still the only software of its kind to fully support SharePoint’s recurring events, allowing users to set up regular reminders for meetings, monthly reports. etc. Reminder is the longest established SharePoint Alert product on the Market (and still the best we think!) we are always working on new features – both those requested by our customers and new ideas that our developers come up with. The rich text editor had been on our to-do list for a while now, it has been regular customer request over the past few months, so we are glad to have got it out in time for Christmas! Download a free 30 day trial of the new version of Reminder – and let us know what you think.